If you ever made a typo in a comment on Facebook, you can now go back and fix it. The social network has started rolling out a feature where you can edit your comments on posts and view the edit history, something that should arrive for most users over the coming days. Up until now you had only a very limited time window to edit a comment. Just a few seconds after you posted, if you pressed the X to delete the comment, you had the temporary option to edit the comment for any reason. Perhaps you made a typo or changed your mind about what you said. You can now edit your Facebook comments at any time. Now, this option becomes a permanent fixture without a time limit. You are allowed to go back and edit any comments you have made on posts on the social network, whether they are from today or last month. When you hover over the top-right corner of your comment, you will now see an option called “Edit or Delete”. If you click Edit, you will be allowed to make changes to the comment, add or delete words and so on. This is much more useful than the temporary editing capabilities you had so far, as it allows you to go back through your timeline and edit any comments you made. It’s also more useful than deleting a comment altogether and then reposting it, which would otherwise prompt a notification for those involved in the thread. Just don’t think this is not trackable. 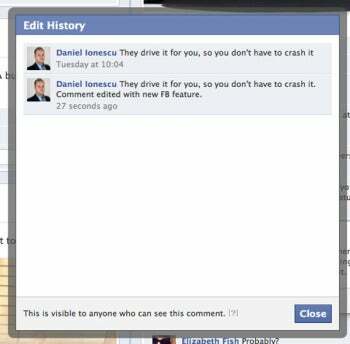 Facebook also has introduced editing history for comments. This means that, once you make an edit, the time stamp for the comment will change and will show “Edited” next to it. When someone clicks on the word, a window will pop up showing your original comment and the edited version -- so don’t think you will be able to get away with making controversial comments and then changing your mind. This feature is also more likely to be useful to correct typos. If there’s one other place where Facebook should be rolling out this feature -- but it has not announced yet -- is editing your posts, like you can on Google+. It’s still unclear whether comment editing will be available on Facebook’s mobile comments plug-in either, which is used by many publishers. This would be an ideal place to allow this function, given that submissions from smartphones can be plagued by autocorrect mistakes.